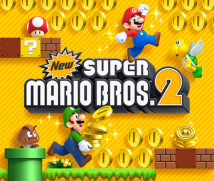 Today, I would like to ask about the New Super Mario Bros. 2 game, soon to be released for the Nintendo 3DS system. Please introduce yourselves, including what you were in charge of for this game. I’m Amano. I was the director. 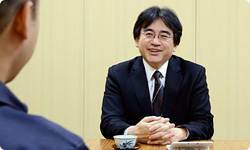 I also participated in the sessions of “Iwata Asks” over the 25th anniversary of Super Mario Bros.1 and Star Fox 64 3D.2, so this is my third time. 1 Super Mario Bros. 25th Anniversary: A campaign carried out in 2010 to mark 25 years since Super Mario Bros. was released for the NES system. 2 Star Fox 64 3D: A shooting game released for the Nintendo 3DS system in July 2011 in Japan. This time again, as if something were guiding me, I got put in charge of Super Mario! (laughs) It’s a pleasure to be here today. 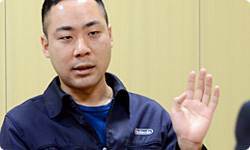 I’m Ishikawa from the Software Development Department. I was in “Iwata Asks” to discuss Mario Kart 73 a bit back, and was involved with New Super Mario Bros. Wii4 before that. As art director on New Super Mario Bros. 2, I was in charge of a number of things, pulling together the overall visuals such as design and direction surrounding the player-character. 3 Mario Kart 7: An action-racing game released for the Nintendo 3DS system in December 2011. 4 New Super Mario Bros. Wii: An action game released for the Wii console on December 3, 2009 in Japan. Okay. First of all, I’d like to ask how this project started. Now normally when people imagine how video games are made, you’d think that it starts off by building its base mechanics, and then work on designing the courses. But I heard this game’s start was a little different. Yes, that’s right. This time the team that researches course design started working on developing the courses first, and the other staff were called in to turn it into an actual product. This format was a first for me. When you say the team that researches course development, you’re talking about what is called the Mario Cram School. Why did the Mario Cram School begin? You said you participated in it. What was it like? 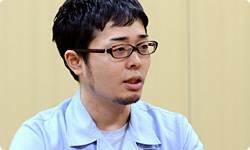 Yeah I did participate in the cram school, but that was around the time when we were working on Star Fox 64 3D, so I wasn’t able to participate with full force. But as someone who worked on New Super Mario Bros. Wii, I had the opportunity to try out a course made in the Mario Cram School that was worked on by about twice the number of staff it usually takes to make Mario courses. A lot of the courses were a blast to play and showed a lot of new ways to play, I really felt we were onto something. Looking at it from that perspective, I thought the concept of the Mario Cram School was amazing. That’s not all. This time the Mario game for Wii U7 is being developed at an almost simultaneous timing, so we had to get two 2D Mario games ready for release. 7 New Super Mario Bros. U: An action game under development for the Wii U console. While the hardware for these 2D Super Mario games is different, you must think about how you can make each game distinctive. Amano-san, did they just dump that on you? Not really, Tezuka-san and (Toshihiko) Nakago-san worked together with me from the start of the Mario Cram School, so for me it was like we were working together, rather than me taking it on by myself. They both thought it would work out somehow. Yeah. And at the start when I was appointed director, we didn’t have any designers. Ishikawa-san, you came in later on as art director. But until the latter half of 2011, you were absorbed in Mario Kart 7, right? Yes. And a little before Mario Kart 7, there was SUPER MARIO 3D LAND8, which was close to a traditional Super Mario game in that it was made in a classic direction, so I thought, “Whoever’s in charge of the next 2D Super Mario game will have a really hard time!” (laughs) 8 SUPER MARIO 3D LAND: A 3D action game released for the Nintendo 3DS system in November 2011. I’m sure you were. Because until that time you were thinking of it as somebody else’s business, and all of a sudden you were the one who had to do something about it. But already at that time, it was decided that two designers from our Tokyo Software Development Department would soon join the team, and later on, a few more designers joined the project who had been involved in Mario Kart 7. The project gained one member after another who had experience developing actual games for Nintendo 3DS. Yes. I thought, “Now we should be able to make something fun!” and began to really look forward to it. But Ishikawa-san and I were the only two core members of this project who had some sort of experience working on 2D Super Mario games. Developers with experience in 2D Super Mario are working on Super Mario for Wii U right now. It was an unprecedented approach, even though Tezuka-san and Nakago-san were both working very closely with the development team, more than they ever had on a 2D Mario game, from the time they took the podium at Mario Cram School to the actual development phases of this project. Yeah. A few people from the Software Planning & Development Department, in addition to their design staff, also joined. I believe quite a number of unique individuals with great dynamic range in terms of capabilities came to participate from the Software Planning & Development Department. Yes. Some knew a lot about games and some didn’t, but the Mario Cram School we mentioned earlier came in incredibly useful. Participants got a firm grasp of the basic ingredients of what makes 2D Super Mario enjoyable and experienced actually making stages, so we were able to begin this project with a solid foundation. In that respect, some new blood came in to those in charge of stage construction theory and actually making the stages. Yes, so I expected that we would be able to make something new that the teams so far hadn’t. In addition, forming such a team made it possible to achieve what we never had before – making two New Super Mario Bros. games at once! 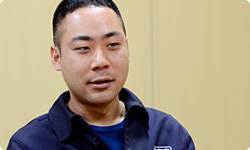 Editor’s note: This interview was originally published on the Japanese Nintendo website. It features videos captured from the Japanese version of the game. In the UK & Ireland this game will be available in English.